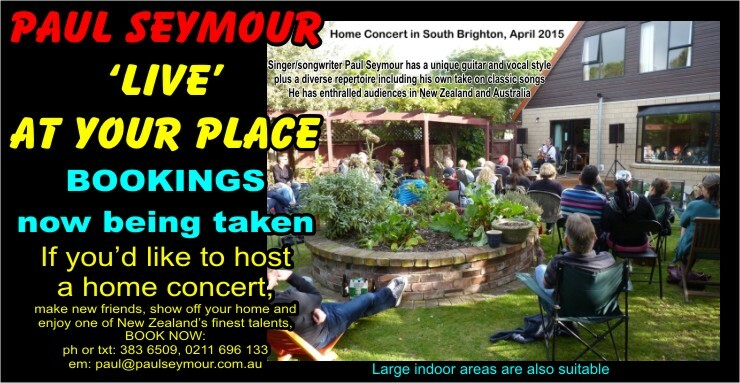 At previous Home Concerts the hosts (owners of the home where concert is held) invited all their friends, family and neighbours to attend, by email, flyers in letter boxes and word-of-mouth. Help will be given to hosts, regarding artwork and design for flyers and email promotion. The artist is usually expected to promote the concert also, inviting extra people. A minimum of thirty patrons attending is preferable, up to one hundred (or whatever the home or garden can hold). Usually the performance is for about one hour and guests are asked to arrive half an hour before the start, to prevent interruptions. After the show, guests are able to socialise and hosts have offered tea, coffee and snacks, the cost of which can be shared if necessary. Sometimes patrons were asked to bring a seat and also their own alcohol if desired. In some cases the entry fee is negotiated with the performer to include a percentage for the hosts. (e.g. : if it’s $7 at the door, $5 is normally for the artist and the other $2 for the hosts). When it’s fine, afternoon concerts work well in back yards but, because of our unpredictable weather, alternative areas should be available, just in case. In the colder months and for night concerts, warmer covered areas are preferable. Bookings need to be made at least one month in advance to allow for preparation and promotion. Please CONTACT ASAP to avoid disappointment.